Five weeks ago, I wouldn’t have even considered calling myself a creative entrepreneur. But now I see it’s not a far-fetched thought - and that it’s entirely possible to launch my creative business within a year. While the technical aspects of this program are definitely the highlight, as with other creative pursuits - it’s really the stories and connections you make with others, that make the work stand out. It’s been super helpful hearing direct feedback from other people going through similar experiences (and challenges) as yourself! Our facilitator, Neha, drew from her own narrative as an accountant turned stand-up comic whose parents were from India but was born and raised in Toronto. Whew! She led the group so well and took the time to listen and provide feedback where necessary. Omer, Jerry and Nikki, to round out the Artscape team, brought their own strengths in community arts to the forefront and were instrumental to how the program went overall. Hopefully, others found it as helpful as I did! The relationships (and friendships) I built with fellow newcomers in the group are irreplaceable and it was humbling, to say the least, to really understand how everyone’s art is shaped by their personal histories. The level of talent in that room was crazy and I’ve never been among such a diverse group of artists! From musicians who played percussion in symphony orchestras, flamenco guitarists to cartoonists and realist painters, I saw and heard of amazing forms of art from all over the world. When people talk about Toronto as a melting pot, this particular group accurately describes that. I've summed up a few learnings and thoughts from each week, and hope this helps you consider joining the program. Take advantage of the unique perspectives you’ll hear and learn from! This week was all about generosity. While I’m what you would call a “giver” more than a “taker” in the realm of human relationships, I learned there was a good middle ground in being an “other-ish giver” - as someone who can build a support network for myself and others, someone who can share time and energy with others in mutually beneficial ways, and as a strong advocate for “paying it forward” especially in terms of work related to building your business and brand as a creative professional. I learned about the qualities of generous leaders, and reflected quite a bit on how we could activate more of those within my immediate Filipino community here in Toronto. We talked about how the program aimed to “re-invent the ‘value proposition’ between artists and audiences, as well as the experience of working in the field,” how many of us need to get out of the “starving artist” mindset and shouldn’t be ashamed of demanding a higher quality of life, and how, if the arts in Canada are to be truly inclusive, our current system of producing and supporting art needs to change. 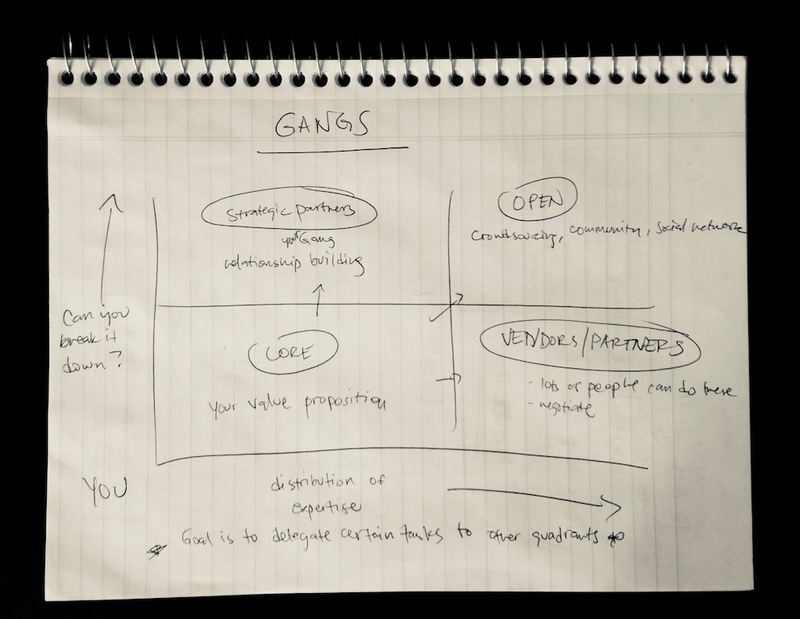 Perhaps my favourite part of this session was identifying and illustrating people I could get into my “gang”. It’s a sensible way of delegating tasks and reframing the work you actually need to do! It was a difficult week that really forced us to think about ourselves and our goals. Because all artistic practices stem from how we interpret our thoughts and experiences, we spent most of the morning sharing our stories as newcomers to Canada. It’s important, even if it takes awhile to draw out! Really listening to our colleagues, being generous with our time and attention (as we learned last week) rewarded us in the end - there’s so much we can gain with authentic, honest communication. Most importantly, I learned I’m not alone! By week two, I knew that being around the people in that room was key, that finding a community who could support you and whom you could collaborate with was gold. Understanding where we each come from highlights the beauty of Toronto - and the incredible opportunities that can arise from harnessing the artistic skill and storytelling capacity of our neighbours. We all have great ideas to contribute, and can all elicit some type of change. Individually, we outlined what we were doing that works (or detracts) from our goals; what our worries with pursuing our business ideas are; what hidden commitments might prevent us from moving forward; and what assumptions we carried in terms of building out or testing our plans for making money through art. For me, this translated into some serious questions about how I really wanted a collective of Filipino food writers and storytellers to look. I knew that food was more than what we cooked at home or what you could order at a restaurant; I knew it was a great entry point to talking about issues that might be harder to approach on their own, such as issues around identity, migration, relationships, how our communities “fit” into the Canadian fabric and how to create spaces where people could engage and connect with Filipino culture, through food. This was my favourite day. We talked about partnerships, overcoming barriers and determining the value of our products and services. In the morning we met with Kerry Swanson, who held leadership roles at the Ontario Arts Council and Toronto Arts Council for over 10 years. She gave us a few points to remember when you think of partnering with someone on a creative project. Our last session that day was with Jerry McGrath, who welcomed us into the program. He asked us to outline the value proposition of our businesses and what types of value we planned to provide. We drew this pie chart and I underlined a direct quote from Jerry that said “creative people drown in ideas”. We ended by talking about three different strategies to take in growing your creative business, using the farming, fishing and hunting approach. This was when the dam broke for me and everything started to make more sense! I won’t bore you with the details of my (many) calculations but I will say this - it’s actually not that far off for me to be charging what I want for my work. It takes a lot of confidence to say that, and it’s telling that I feel confident enough now, having completed the course! 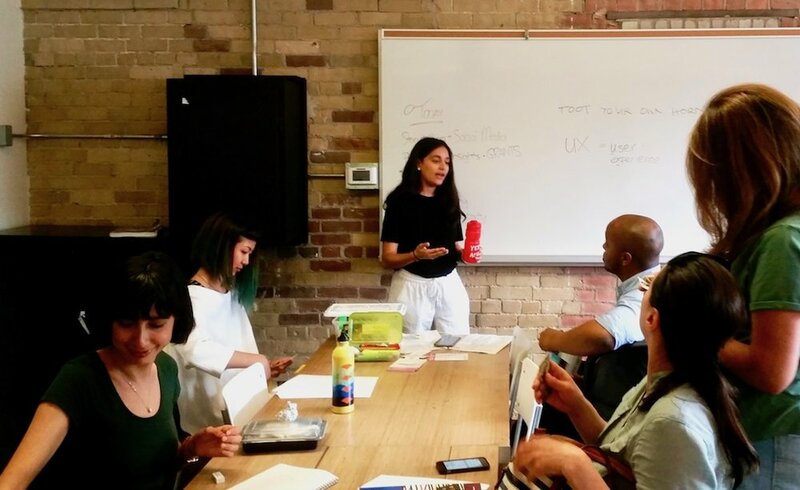 We met with a guest panel including Rupal Shah, grants officer from the Toronto Arts Council, Aitak Sorahitalab, co-founder of an arts-based non-profit called AIRSA and Maya Shouchcair, who works on community development with Shopify. We talked about the conditions you needed to thrive in as a creative entrepreneur, which sometimes, you needed to create yourself. We talked about building your brand and business story around a problem that only your business (a.k.a. your art) could solve. As an individual exercise, Nikki prompted us to answer “What does success look like to me in six months, a year and five years?” Tough questions! Your fears come from someplace inside you. You have to learn to identify them, face them, and ideally find a way to overcome them. Sounds like hokey stuff, but it gets to the point. Understanding why you’re scared takes time and deep reflection. We make art because this (whatever our skill is) is the best way we know to express ourselves. And for creative people - whether you’re a literary, visual or performance artist - sometimes, going beyond that in itself is difficult. But in order for us to earn a living from our creative work in Canada, we need to find new avenues of generating income, and think of ourselves in completely new ways. All artists in Canada have to go through this and the best part of participating in this program is gaining direct connections and support from people in the group. We have a long road ahead of us, but I really do believe that through our collective voices, tapping into and bringing together diverse communities in Toronto, and growing our creative businesses together - we've got unique opportunities ahead, in ways we may not even be thinking of right now. I joked about how it feels like all this knowledge only takes us about 40% there and the remaining 60% is all still on us, as it has to be. It’s overwhelming, for sure, but you don’t get to your goals without putting in the work!